Every so often, I come across a book series that really intrigues me with elements of the setting. 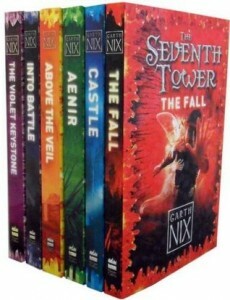 Because I really enjoyed his “Keys to the Kingdom” series, I put some faith in Garth Nix and picked up “The Seventh Tower” series. The six books of the series describe a world in perpetual darkness, where a magical Veil surrounds the planet, forever blocking the sun from the earth below. Above the Veil, the world continues as it has always been. Below the Veil, the planet is shrouded in perpetual ice, cut off from the heat and light of the sun. Bridging the two worlds is the ancient Castle, home of the Chosen, and the foundation of the seven Towers. The Chosen use magical sunstones to provide light and heat to their home, for only the Towers rise through the Veil to the light. The Castle, as the world below, lies in utter darkness. The Chosen are served by spiritshadows, spirits from the world of Aenir who have been bonded to Chosen and brought back to the Dark World, where they take the form of shadows. Tal is one of the Chosen, but his father has gone missing, and the responsibility to care for his sick mother and younger siblings has fallen to 13-year-old Tal. Unfortunately, he lacks a sunstone strong enough to journey to Aenir and complete the ritual that will allow his family to rise through the social ranks and continue to live within the Castle as Chosen instead of the servant class known as Underfolk. When Tal fails disastrously in his attempt to gain a sunstone, he falls from the castle to the ice-covered world outside, where he meets Milla. Milla is an Icecarl, one of a nomadic, viking-like people who follow the great herds of animals in their migration across the ice. The leaders of her tribe assign Milla a Quest to help Tal get home and bring back a sunstone to her tribe. The Quest will take Milla and Tal across the ice, through the darkest recesses of the Castle, and into the spirit world of Aenir to battle against a secret traitor seeking to destroy both the Castle and the world of the Icecarls. The two teenagers will not emerge from this ordeal unscathed, nor will their beliefs go unchallenged. Both young people must endure, not only physical hardship, but tests of spirit and mind that will change them on a fundamental level. I think that’s all I can say about the plot in good conscience. But at the same time, this series is written for teens, and plot is fairly straightforward, although dramatic revelations do come at a steady pace that keeps the tension on an upward swing. I found several things intriguing about this series, starting with the shadowspirits. These come in three kinds: shadowguard, shadowspirits, and free spirits. Shadowguard are spirits that are bonded to children as a mark of their status as Chosen. The particulars are not made clear, but it is implied that this is done by the parents during a journey to Aenir. All shadow creatures come from Aenir. Bonding a shadow to a Chosen replaces the person’s shadow with the spirit, who remains Aeniran while in Aenir, but becomes a shadow in the Dark World. Most Aeniran spirits pressed into service this way are animals of some kind, but a few are … something else. We’ll get to that in a minute. Shadowguard are loyal in the same way as a favored pet, if considerably more versatile and intelligent. Bound shadowspirits are mostly larger animals, and have many of the same abilities as shadowguard, but are stronger and retain more of their native qualities. One important difference – shadowguard can change shape easily, while most shadowspirits cannot. Free spirits are Aenirans that have crossed into the Dark World without being bound to a human shadow. These are individual beings, seldom simply animals, with individual wills and agendas. This leads to the nature of Aenirans. While creatures in the Dark World are just animals, fantastic to be sure, but not possessed of magical abilities, most everything in Aenir is alive. The forests walk around, whirwinds guard sacred treasures, plants act as sentries. A mountain gets up and stretches once a millenium – just to get the kinks out. At one point, Tal holds a conversation with a lake. The idea of animals and locations having essential and vital spirits is not new. Plato called it the “ideal self”. New Age philosophy imbues everything with its own individuality. And don’t get me started on the philosophical ramifications of the whole Herbie franchise…. But as cool as that is, its not what intrigued me the most. At this point in my jaded readership, that kind of thing just seems like standard fantasy fare. No, I liked the idea of binding spirits to serve as companions and guards, and the possibilities presented by Nix’s use of vague descriptive terms such as “shadow flesh”. While most of the shadowspirit relationships are presented as owner/pet, or at best master/servant, I can see how this type of relationship would appeal to a teen audience. During a time of life when everything is growing uncontrollably and in strange directions, having one other person upon whom you can depend and with whom you can safely quarrel without fear of rejection or unforgiveness – I gotta say, that’s inviting. There is something essential within all of us that desires that kind of relationship. As adults, we often seek that in marriage and the promise of a family. As Christians, we are promised that kind of relationship with the Holy Spirit. In Nix’s world, the shadows fill this void for the characters, and serve as an essential catalyst for their growth. The rest of the action really serves as the backdrop for the dynamic relationships between the characters. The magic and setting is cool – I’ll get to that – but it’s the give and take between Milla, Tal, and their shadows that really kept me reading. Okay, light magic. The Chosen run their entire society around Light Magic, useful in a world where the sun has been cut off entirely. This is basic “Green Lantern” type stuff. They can form force field objects, blast rays of destruction, use limited healing magic, and more basic heating and light provision. It’s cool; Garth Nix makes good use of it, and it makes me want a sunstone of my own, but not especially unsusual for the genre. The Icecarl society is pseudo-viking-slash-amazon in nature. They live on the ice in a nomadic structure that emphasizes physicality and places little value on intellectualism. I should point out here that the Chosen society is exactly opposite, valueing intellectual development over physical prowess – and Nix doesn’t neglect the literary value of contrasting societies as metaphorical tools, complete with the reactionary, revolutionary, and stagnant contingents. The main warrior force of the ice-carls is the Shield Maidens, with men performing duties as hunters and legendary heroes. It felt very familiar, like the characters are rebelling against type solely in an attempt to be different or to strengthen the character. 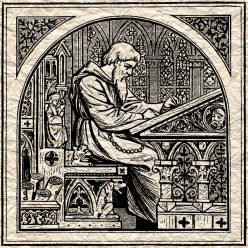 This literary device is absent in Nix’s later works, and shows his growth as a writer. In “The Seventh Tower”, it is merely distracting without being destructive. All in all, I stayed up way too late for way too many nights in order to finish reading this series, but I can’t say I regret the time spent that way. The books read quickly, and are meant for teens while remaining interesting and approachable to adults. I really enjoyed “The Keys to the Kingdom”, and “The Seventh Tower”, although written earlier in his career, was every bit as involving and the world just as fully realized. I’m not so sure I’d care to share my shadow with any of the real or fantastical creatures I met in this series, but I think I’d like a sunstone, and just a smidgen of Light Magic for coolness. Next Next post: Recorded Live!